Tax Day and I hope everyone in the US got their taxes in. I finished ours about a month ago while on the road. 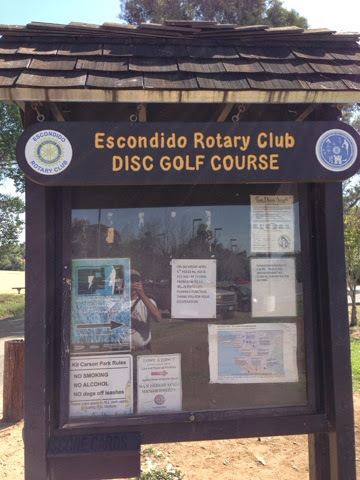 Today I went to Kit Carson Park in Escondido and played Disc Golf. There were a number of players our on the course but they were disbursed throughout the course. I eventually caught up to a man and his young son on the 10th hole. They offered for me to play through, which I did, but took the opportunity to get into a conversation. While we were talking, I was thinking of his son, who threw disc well for his age of 6 or 7, and the disc basket at Costco. I brought up the disc basket and he said they bought one and said it was made well for the price. So, anyone that wondered about the quality for the price for the Costco basket I guess it is good. Fairway for last hole. 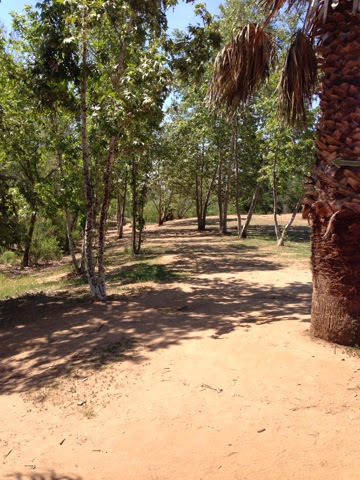 Of course I hit a tree on my drive, but my second toss got me near the basket, down to the right. When I finished playing I happened to see an Innova sign on a building with an open sign. Innova is a disc company and my suspicion that it was a pro shop was right. I have been here a few times before and never saw it. I went over and checked it out. They had a good selection of drivers, midrange, and putters, but not like the pro shop at the Marshall Street course in Massachusetts. Omo is what the granddaughters call Denise. It started out as Little Oma, Oma being the name our children call Denise's mother. Oma was lost in translation and it ended up calling her Omo. 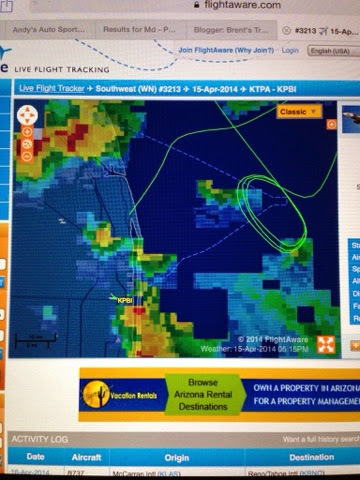 Denise (Omo) got to Ft Lauderdale airport during a line of thunderstorms that delayed her plane. Her incoming plane needed to circle for awhile and then landed at a Palm Beach Airport. North of Fort Lauderdale. 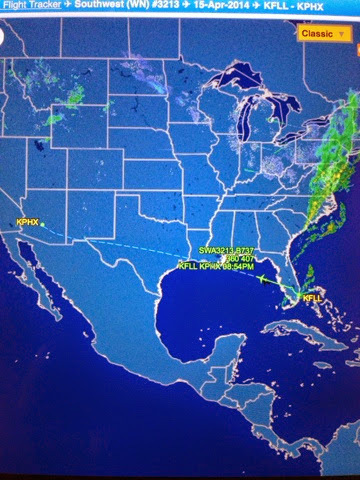 Here is where the plane went off the screen and the status changed to "Diverted". Denise and I then talked and she went to check on an alternate flight and Sourhwest found a plane. It could have been the original plane that landed in Palm Beach and then they flew it over. In any case, she was getting on a plane to Phoenix. I then started tracking her connecting flight and it was originating in Providence, RI and was flying to Orlando. The good news was it too was delayed about the same amount of time Denise's flight was. So, this flight from Orlando is flying to Phoenix and Denise's flight from Fort Lauderdale to Phoenix take off within a few minutes of each other. I check and the assigned gates in Phoenix are next to each other. I had confidence that Denise will have time to meet her connection. Although delayed into Phoenix and then delayed to San Diego it is better than being stuck in dome sitport. 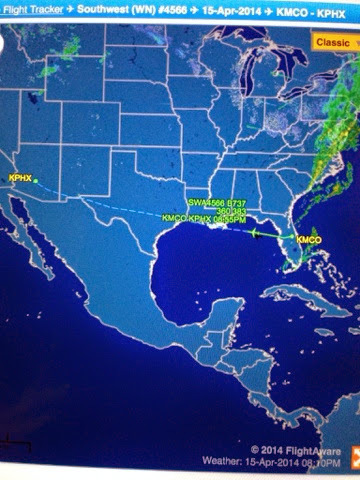 This is Denise's flight from Florida to Arazona. This is the plane that Denise will connect with in Phoenix. It is just ahead of hers on the same track. Denise made her connection in Phoenix having the gate of her plane right next to hers. In the end her plane unloaded before theirs. Omo arrives. The girls will be all over her in the morning.